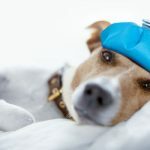 With all of the commitments that you have going on during any given day including kids, school, work, sports activities, and more, keeping your dog on a feeding schedule can be a challenging task. However, having the best automatic dog feeder is an effective way to ensure that your furry friend gets their meals even when you're not home. Since there are hundreds of automatic dog feeders available, we picked out what we believe to be the top five and reviewed them. We also put together a comprehensive buyer's guide because we wanted to give you all of the parts and pieces you need to pick out a quality automatic dog feeder. An automatic dog feeder is a feeding device that dispenses your dog's food either by gravity or by electronic pre-programming. They come in several sizes. However, they all have the same general parts and pieces with some being more electronically advanced than others. The top part of the dog feeder is where the excess dog food goes until it dispenses, and it's typically made out of glass or plastic. The bottom portion is where the food dispenses into, and this hopper usually has a plastic, glass, or ceramic bowl. Convenience - You don't have to worry about rushing home to feed your dog at their typical time. 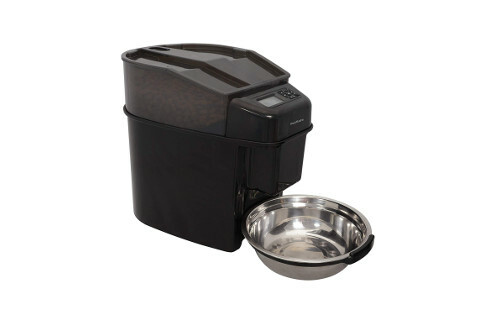 Instead, the automatic dog feeder will do this for you and dispense food at the set time if you have an electronic one. Less Cleanup - Once you pour the food into the reservoir and set the portion size and time you want it to dispense, you can relax. There is less cleanup involved because it portions the food for you without dirtying measuring cups. Portion Control - People with overweight pets can find it difficult to monitor and control their dog's food intake. Electronic automatic feeders allow you to set the exact portion size, what time it dispenses, and how many times a day your dog eats. This can help them lose weight and stick to a diet. 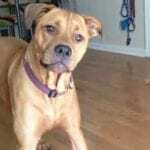 Schedule - It's important that you get your dog on a feeding schedule and stick to it. 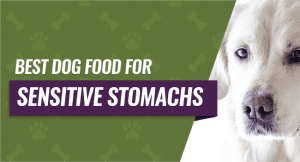 Feeding your dog at the same time each day with the same amount of food can help to prevent digestive problems or upset. Speed Control - Some dog breeds tend to throw up or have digestive issues after they eat because they eat so fast. Certain automatic feeders have a slow portion dispense option that forces your dog to eat slower because it stretches the dispenser time out over several minutes. There are two main types of automatic dog feeders to consider and choose between. Both work well, but one type may work better for your situation than the other type. Electronic dog feeders come with programmable settings that allow you exact control of your dog's feeding times, portion size, and how many times they eat each day. Some come with additional features like voice recording, infrared sensors, and LCD display screens that make it relatively easy to program them. 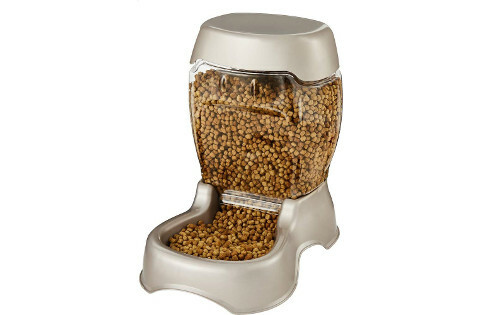 The gravity automatic dog feeder uses gravity to dispense dog food when your dog starts eating. Once the food level goes down, gravity will trigger more food to go in the bowl. You want to avoid this if you have an overweight dog. After you settle on a type of automatic dog feeder, you can start comparing products by taking a look at our buying considerations. These points will help you pick our the best automatic feeder to suit both your lifestyle and your dog. The reservoir is the storage compartment on the top of the automatic feeder. It's important that this is airtight because this can help to keep your dog's food fresh if they eat it over the course of a few days. Make sure that you double check the seal around the reservoir's lid. Make sure you check the battery life of any automatic feeder you're considering because it won't dispense if the battery dies. You want a long battery life because you typically have to input all of your settings each time you switch out the batteries. How much kibble your automatic feeder can hold is important because you don't want to have to fill it at the end of each day constantly. People with larger dogs should most likely look for a bigger capacity while people with smaller dogs can get away with buying a smaller dispenser because their dogs don't eat as much. You'll have to clean and maintain your automatic feeder regularly if you want it to function to the best of its ability. Look for automatic feeders that are easy to take apart, dishwasher safe, easy to reach all of the nooks and crannies, and that have wider openings to fit your hands through to clean. You really want to pay attention to your automatic feeder's durability because this can be a slightly more expensive investment. Double check any attachment points, locks, reservoirs, and feeder materials to ensure that they'll last. You'll want to get an automatic feeder that features a quality feeding dish that is non-toxic and safe for your dog to use while being easy to clean. Look for ceramic or stainless steel over plastic, and make sure your dog's plastic dish is BPA-free if you do end up with one. Take a look at the size of your dog's kibble and compare it to the recommended size kibble that the feeder recommends. Getting the wrong size kibble can result in the feeder jamming or allowing far too much food to fall into the bowl each time it dispenses to your dog. The security measures of your automatic feeder are very important because you don't want your dog to be able to get into more food than they're supposed to have. Look for things like secure connection points, a solid base, a reservoir lock, and anti-shaking capabilities, so your dog can't trick the machine into letting more food out between meals. This large capacity automatic pet feeder by PetSafe can hold enough food for 12 meals at two cups per meal. The feeder allows you to dispense portions starting at one-eighth of a cup and going up to four cups per meal to suit your dog's needs. You get a semi-large screen that displays the portion size, time, and the preferred feeding method including an optional slow feeding method that'll spread your dog's feeding time over 15 minutes to prevent eating too quickly. The unique conveyor belt design lets you have larger or smaller kibble in this feeder without worrying about it getting stuck or jammed. This feeder comes with a lid, bowl, and hopper that are easy to clean because you can put them in the dishwasher without an issue. The feeder is designed to be durable and safe because it's made with BPA-free plastic and stainless steel. Dog parents who bought this automatic feeder liked that it came with an optional slow feeding setting that portioned the food out over 15 minutes. Dog parents did note that this feeder was more difficult to program because the buttons don't have labels. This gravity-fed feeder by Petmate comes in several sizes and colors ranging from three pounds up to 12 pounds that allows you to customize it based on your dog's dietary needs. The gravity feeder technology slowly dispenses food as your dog eats to ensure that your dog has food available when they need it. You'll be able to quickly and easily clean this dog feeder because it features a wide mouth bottle that snaps off of the base of the feeder and allows you to wash it. The top of the feeders comes equipped with a secure snap-on lid that stops your dog from getting into their food unless it dispenses. The wide base of this feeder helps to ensure that your dog can't tip it over and spill all of the stored food when they eat. Also, the base and bottle snap together to make a secure holding station for your dog's food. Dog parents who bought Petmate's gravity-fed dog feeder where happy that it came designed to be very sturdy and secure without being bulky or very heavy. Dog parents did note that the feeder worked best when they propped the back end of the feeder up slightly because it needs height to dispense the food. This sleek automatic dog food dispenser by Arf Pets can hold up to 10 24-milliliter portions of dog food at one time in the 1.14-gallon reservoir. You can set up to four different alarms throughout the day with different portion sizes to keep your dog fed on a schedule. The blue LCD screen makes it very easy to see and set your desired meal times, portion sizes, and how often you'd like the feeder to dispense. The feeder's lid comes with a magnetic lock that helps to prevent your dog from accidentally opening it and eating or spilling the food. You'll get a very user-friendly design that features a bright screen, large buttons, and clear labels all wrapped in a sleek and durable housing. You can run this automatic dog feeder on batteries or by the adapter, and it only uses four volts of electricity to run. Dog parents who purchased this automatic feeder liked that it comes with a sleek and durable metal design with a secure magnetic lid. They did say that having the power button on the bottom of the feeder is slightly inconvenient. This large automatic feeder by Westlink can dispense between 1 to 39 food portions at 10 to 12 grams per portion between fills. You can record 10 seconds of voice commands and project it over the speaker to call your pets to the feeder when it is time to dispense their meals. The infrared detection that comes built right into this feeder helps to prevent food from spilling or getting stuck when your dog eats or bumps it. The top of the feeder features a secure locking system that makes it easy to fill and lock the food into the reservoir without worrying about your dog getting into it. The bright LCD panel comes with on and off displays for breakfast, lunch, dinner, and a fourth meal, low battery indicator, microphone and speaker settings, meal size, and a time display. It's designed to be very easy to operate and set by pet parents of all ages. Dog owners who purchased Westlink's automatic dog feeder were happy that it came with such a bright and user-friendly LCD display. They didn't like that you had to choose from either a large or small kibble dispenser because it doesn't allow both. Iseebiz's automatic feeder comes with a large three pound maximum capacity that allows it to dispense up to 39 portions of food at five grams each portion. The mouth of the feeder comes with an infrared sensor built into the wall that monitors the kibble as it comes out to prevent clogs or overflow. This feeder lets you set for separate meals every day with specific times and specific portion sizes to help keep your dog full and on schedule. The bright LCD screen shows you whether the meals are set or off, the time, how much each meal portion is, voice recording, and voice play. You're able to record up to a 10-second message with this feeder that you can set and use to call your dog to the feeder when it's time for them to get their meals. You can power this device either by batteries or through an adapter that plugs into the wall and consumes a low amount of energy. Dog parents who bought Iseebiz's feeder where pleased that it came with so many customizable controls like multiple meals and portion sizes. They did mention that the feeder is slightly more top heavy when it's completely full. Our pick for the best automatic dog feeder is PetSafe Healthy Pet Simply Feed Automatic Cat and Dog Feeder because it has a food reservoir that is large enough to hold 24 cups of food with a single fill. We also liked that this automatic feeder comes with a slow feed option that spreads the portion size out over 15 minutes. The bright LCD display makes it very easy to program and change your dog's meal time and their portions. Finally, this automatic feeder was very quick and convenient to clean because the BPA-free plastic is dishwasher safe.